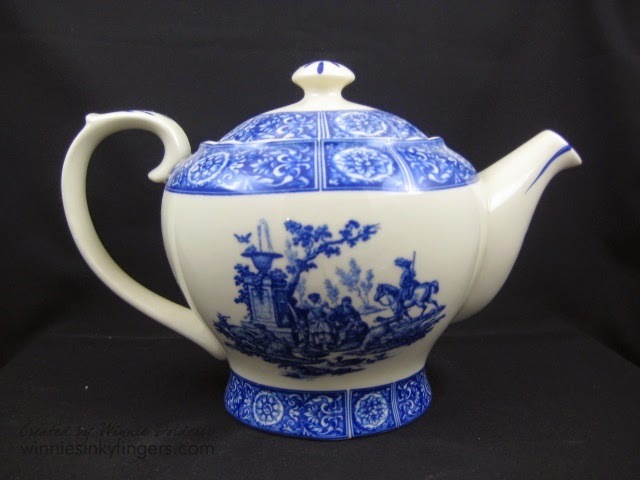 Today I am sharing another of the tea pots in my collection. This one I found shopping one day and I knew I had to take it home. I love the shape, and the scene on it. Even though this tea pot is new, it does have a vintage feel that I love. Yes, the teapot looks very much like the vintage tea pots from both Japan and England during the time of the Far East Trade, bringing tea and all the lovely china to the west. What a beautiful teapot! I love blue and white anything. I love the old-fashioned scene on your teapot. I'm very much into toile! Thank you for sharing at Tea Time and enjoy your day. Such a pretty tea pot, looks English with an Asian influence, or vice versa? Looks like a good "pourer" too, one of the things I like best about a tea pot. Thanks for stopping by and visiting. The teapot appears to have an Oriental look to it and it does have a nice shape. I like the bottom; a good acquisition for your tea time.